ACPC Merit List 2019 – ACPC will release the provisional merit list for B.Tech and B.E courses. Candidates can access it from the link below. ACPC Merit List 2019 will release for BE / B.Tech, Degree / Diploma Pharmacy, Architecture, Bachelor of Planning, Hotel & Tourism Management, Diploma to Degree Engineering, ME / M.Tech / M.Pharm, MBA / MCA. The link to access all will be provide don this page. ACPC will release\ Provisional Merit List, as well as, Final Merit List. Candidates can check more details about ACPC Merit List 2019 from this page. ACPC announce Merit list after successful conduction of the exam. The merit is only announced online. Merit List is released at the official website, www.jacpcldce.ac.in. A direct link to access it has been updated here for the ease of candidates. The merit list given below is of the last year and is only for the reference purpose. You can check the merit list directly from here. AS it will keep on releasing for the respective courses, we will keep on updating it here. Candidate whose name is in the merit list are eligible for the Gujarat Counselling for respective courses. Click here to check important instructions regarding confirmation of admission. Click here to check important instructions regarding cancellation of admission. Click here to check notice regarding second round choice filling. Click here to check notice regarding understanding of M.E. / M. Tech Merit List. Click here to check notice regarding understanding of M.Pharm Merit List. Click here to check Important Notice of ACPC for MBA and MCA. Click here to check the Important Instructions regarding Confirmation of Admission of Round-02. Click here to check important instructions regarding counselling. Click here to check important instructions regarding reshuffling. Click here to check notice regarding Provisional Merit List and Choice filling for Mock Round. Click here to check Advertisement for Vacant Quota. Click here to check Help Center for Vacant Quota. Click here to check the Final Vacant Seats due to Not-Allotted, Non-Reported and Withdrawal as on Aug 03, 2018. Click here to check MBA Vacant seats after Round-1. Click here to check MCA Vacant seats after Round-1. Click here to check MCA Lateral Vacant seats after Round-1. lick here to check vacant seats left after Mock round. Click Here to check the Vacamt Seats of diploma to degree pharmacy. Click Here to check the institute wise First Round Filled and Vacant seats for MCA Lateral. Click Here to check the institute wise First Round Filled and Vacant seats for MBA. Click Here to check the seats vacant due to non-allotment in BE round 1. Click here to check the GTU Round 1 first to last rank position of candidates. Click here to check the RKU Round 1 first to last rank position of candidates. Click here to check the DDU Round 1 first to last rank position of candidates. Click here to check the Nirma Round 1 first to last rank position of candidates. Click here to check the IGTR Round 1 first to last rank position of candidates. Click here to check the CIPET Round 1 first to last rank position of candidates. Click here to check the UTU Round 1 first to last rank position of candidates. Click here to check the CUShah Round 1 first to last rank position of candidates. Click here to check the Ganpat Round 1 first to last rank position of candidates. Click here to check the ITMVU Round 1 first to last rank position of candidates. Click here to check the BE Round 2 Analysis Course Wise. Click here to check the BE Round 2 Analysis Institute Wise. Click here to check the BE Round 2 Analysis Vacancy. Click here to check the BE Round 1 course wise first to last rank position of candidates. Click here to check the BE Round 1 institute wise first to last rank position of candidates. Click Here to check the BE Mock Round Institute Wise First – Last Rank Position of Candidates. Click Here to check the BE Mock Round Course Wise First – Last Rank Position of Candidates. Click Here to check the Pharmacy Mock Round First – Last Rank Position of Candidates. Gujarat ACPC regulates the admission of candidates to the professional degree courses respectively. ACPC Merit List has been announced. Candidates can check here the course wise merit list which will be provided below as per official announcement. How to Check ACPC Merit List 2019? It will open the merit list portal. There, the candidates will have to enter GUJCET User ID and course. Next, the candidates need to click on ‘Go Get It’ button. Check the merit and download the result. ACPC will release the the PCB and PCM Percentile table (As provided by respective Board) for : Gujcet, GSEB, CBSE, ISCE and Cambridge. Candidates can check it from the link provided below and it is given in pdf format. Percentile table given below is as per the last year details and only for the reference purpose. Insofar, Official details regarding ACPC Admission merit list 2019 has not been released. Information on this page is as per the last year details and only for the reference purpose. 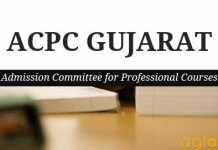 As soon as the ACPC Gujarat release the information regarding ACPC Admission merit list 2019 the same will be updated here on this page. What should we write in the place of user id for the login of acpc. Hey there can I ask for which course you’re signin ?